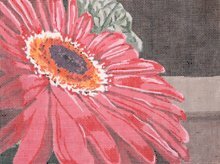 A bright colorful single gerber daisy in red and pink colors by KAMALA. This canvas is offered by JulieMar. Measures 9 x 12" on 13 mesh. We can also provide this canvas with threads. If you want cotton we provide DMC Floss. For Wool or Silk we use Planet Earth wools & silks. Just scroll down and choose your preference. If you want to keep this canvas taut while you stitch it then we recommend mounting it onto one pairs of 13" and one pair of 16" stretcher bars with some thumb tacks. The stitched needlepoint canvas can be framed or made into a lovely bright needlepoint pillow.